The following guidelines apply to the full range of Farrow & Ball Primers & Undercoats. 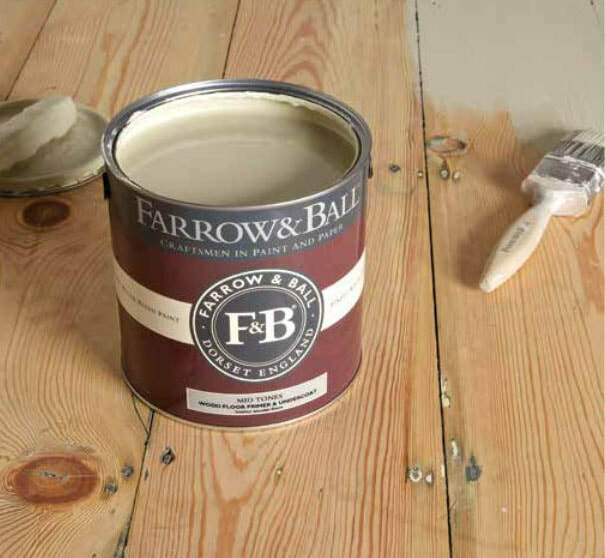 Farrow & Ball Primers & Undercoats have been specially formulated using the same finest ingredients and rich pigments as our topcoats. For long lasting results and to achieve a perfect, even finish, make sure you use the appropriate Primer & Undercoat. This primer and undercoat provides an even base for interior walls and ceilings and gives a consistent surface to repaired walls. Offers excellent adhesion and promotes a long-lasting finish. Available in four colors (White & Light Tones, Mid Tones, Red & Warm Tones and Dark Tones) designed to match the chosen top coat color. For use on bare wood or previously painted wood surfaces. This product helps you achieve a perfect base on which to apply your chosen finish. This durable primer and undercoat is for use on internal wooden floors only. Promotes a long-lasting finish. Not suitable for use on exterior decking. Available in four colors (White & Light Tones, Mid Tones, Red & Warm Tones and Dark Tones) designed to match the chosen top coat color. This primer and undercoat provides a protective, flexible and breathable foundation for exterior bare or previously painted wood. Offers excellent adhesion and promotes a long-lasting finish. Available in four colors (White & Light Tones, Mid Tones, Red & Warm Tones and Dark Tones) designed to match the chosen top coat color. This rust inhibiting primer is suitable for use on metal surfaces when using Full Gloss or Exterior Eggshell. It can be used on gates, railings, garden furniture and metal down pipes and is available in four complementary color tones to match your chosen top coat color. Available in four colors (White & Light Tones, Mid Tones, Red & Warm Tones and Dark Tones) designed to match the chosen top coat color. Use on interior walls and concrete floors and exterior walls, to seal and stabilize porous, chalky and unsound (crumbly) surfaces. Offers excellent adhesion. Not for use on fresh concrete. White colored, dries clear. This primer blocks resinous stains on bare hardwoods, resinous softwoods and knotty areas. For use on interior and exterior woodwork and may be used to patch prime wooden floors. Available in one color.